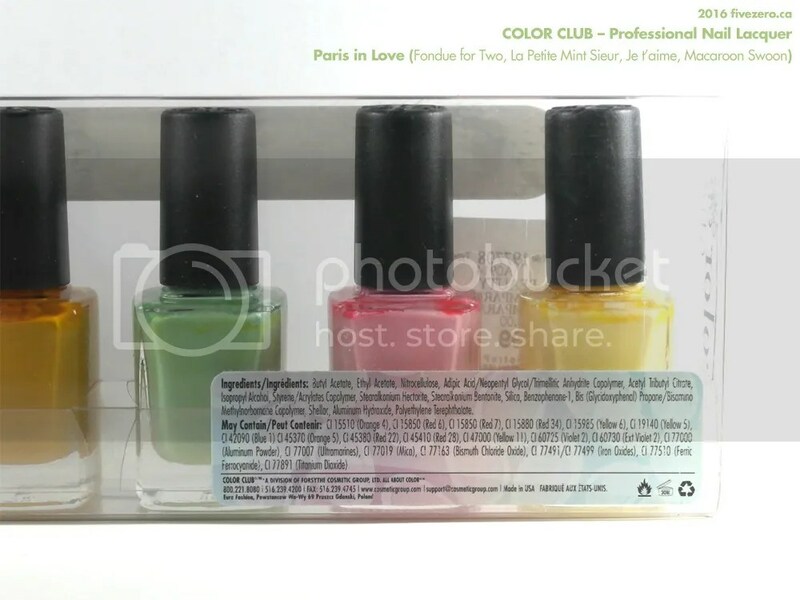 The Color Club packs sold at Winners are typically unlabeled, but the colors all looked like the ones in Color Club’s Spring 2014 Paris in Love collection. I’ll have to label the bottles myself. La Petite Mint-Sieur (1038) is a pastel, leafy green cream. Very pretty, like mint ice cream! My French is no good, so the only meaning I can imagine for the shade’s name is that it’s an awkward play on the word monsieur…but, surely the name should be Le Petit Mint-Sieur (masculine for The Little Gentleman)? I’m not getting something, or else I’m overthinking the name of a mint green nail color! The formula is pretty good for a pastel: two coats works well, though if you’re very picky, you might prefer a third. Color Club Professional Nail Lacquer retails for US$8.50 (I’ve rarely seen it in Canada outside of Winners, but never checked the pricing) and is 0.5 fl oz / 15 mL. It is cruelty-free and made in USA. Color Club is one of the lines produced by Forsythe Cosmetics Group, which was founded in 1979 by husband and wife team Buddy & Harriet Rose. Along with Color Club, the company also makes Art Club, Ruby Wing Color Changing Polish, and private label polishes for distributors and nail salons. The company is based in Freeport, NY, USA. It drives batty that these sets do not have the shades individually labelled. I spent so much time trying to decipher which is which, and even then I’m not 100% sure.